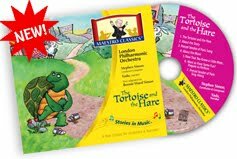 Maestro Classics, publisher of a series of CDs that aims to integrate classic stories with great orchestral music, sent me a copy of The Tortoise and the Hare to review. I had listened to some of the sample clips on the website, and honestly I was not expecting to like this. But when it arrived, I opened it up, took a look at the little booklet that comes in the CD, and I started to be more hopeful. The Stories in Music series features a narrator backed by a symphony orchestra, and the goals listed on the first page of the booklet intrigued me. Stephen Simon, the conductor and composer, is trying to teach families how to listen to music. So this is about great stories, learning to listen, expanding musical horizons, and learning other things as well. Looking through the booklet, there is great information on music -- such as a spread picturing the instruments of the orchestra, another page picturing the instruments in a Dixieland band, great pages on the types of notes, rests, and time signatures, and information about the contrabassoon. There are pages about turtles & tortoises, and rabbits & hares. The music and lyrics for the Pretzel Vendor of Paris, a song featured within the story, is included, along with some little activity pages like a dot-to-dot pretzel, a word jumble, and a crossword puzzle. There are bios of the conductor/composer, the executive producer, and the narrator. The Tortoise and the Hare. This is roughly 21 minutes, and features a modern telling of the story, accompanied by the orchestra. My kids are familiar with the story, but found this version interesting. Especially with the music. About the Story. Three minutes of background on Aesop, including a reading of the 'original' tale, and some discussion about the moral. Pretzel vendor of Paris. Two minutes. About the Music. Five minutes of the composer/conductor telling about the music. This was fantastic. He points out all kinds of interesting things about his choice of rhythm for the hare, or his choice of instrument for the tortoise (the contrabassoon), along with other interesting tidbits. Now That You Know a Little More. This is track 1 over again, and it was great to listen to after hearing the previous track. Prepare to Perform. Not even one minute... just an introduction to the next track. Pretzel Vendor of Paris Sing-Along. This is just the accompaniment, so you can sing along. Or more talented people than my family could sing along anyway. This CD got two thumbs up from all of us. My older kids especially enjoyed the composer's information. My younger kids mostly liked the story. Though Richard picked up on the French part. He's becoming quite the little Francophile here. What did I love? I loved the vocabulary used. Words like computed, exceedingly, fateful, confided, subject (as in "subject yourself to..."), preordained, optimistic, brow, admirable, perseverance, gait, and so on. And a handful of French words that I couldn't possibly spell correctly. The variety of music represented was fantastic too. I loved listening to the "About the Story" and the "About the Music" tracks. We liked it so well that I put other titles on a Christmas wish list. And I found that my library has one of the titles... Mike Mulligan and His Steam Shovel. So that was put on hold. And it is amazing. We learned about the difference between Irish and Scottish bagpipes, learned some fascinating things about Virginia Lee Burton and how she wrote books... I want to own this one, not just borrow it. Check the Maestro Classics website for a list of titles, all of which are currently on sale at 3 for $45 with free shipping. I have my heart set on The Story of Swan Lake, The Sorcerer's Apprentice, and oh, I don't know what for a third one. Coming soon: A Soldier's Tale (Stravinsky), and My Name is Handel (Water Music). Negatives? I can't really think of any. Unless you have kids that are 'too mature' for stuff like this... but I'd still recommend that you force it on them. My tweens kind've rolled their eyes at me when I put Mike Mulligan on in the car (captive audience! ), but they loved it once it got going. Disclaimer: As part of the TOS Homeschool Review Crew, I did receive this CD for free from Maestro Classics. The fact that I received a complimentary product does not guarantee a favorable review. It does guarantee a review. A fair review. But I am not going to praise something unless I think it deserves the praise. If I don't like it, you'll hear that. And hopefully with enough detail as to why so you can decide for yourself if what I hate about it makes it perfect for your family. For more about my take on reviews, visit my blog post here. This is a belated thanks for the wonderful review of our Tortoise and the Hare CD. I just wanted to let you know that since you reviewed our CD we've made a Facebook page so that our fans can participate in monthly giveaways (we have a big one coming up for the full 8 CD set!) and get coupons. We'd love to invite you and your readers to join our page or check out our new free homeschool music curriculum guides and thanks again for the lovely review!